Dr. Schumacher has been in practice for more than 14 years. As an experienced dental health professional, he loves helping patients achieve an improved sense of health and wellbeing. Being a prosthodontist also gives him the opportunity to express his artistic abilities through the areas of cosmetic and restorative dentistry. Prior to opening his Wakefield practice, he completed his undergraduate studies at Asbury College in Willmore, Kentucky. 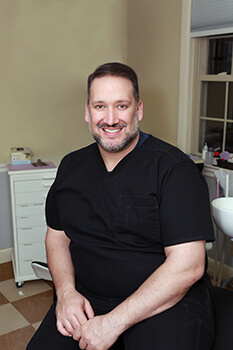 For dental training, he studied at both the University of Kentucky and the University of Michigan. When he’s not helping patients, Dr. Schumacher loves to be with his family. He and his wife have been married for more than 20 years and together they have one daughter and two boys. His interests include working out, hunting, traveling, and photography. He’s also a fan of the University of Michigan’s sports program, and he loves helping his children with school projects.